Its price is only 60 pounds, but in America you can easily buy it in 70$, and its feature is that its battery life is almost 15 years. 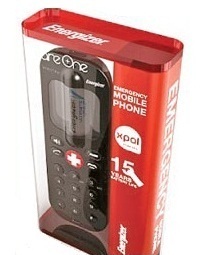 You can easily make calls by using this Emergency cell phone. You can broad cast your geographical location, it also have torch and it have all basic features which anybody need in emergency condition. So that’s why it is also known as Emergency Mobile Phone. Basically its original name is SPARE ONE and it is very unique. It only runs by a single lithium polymer battery, which give it charging up to for 15 years. This phone does not contain camera, web browsers, or advanced high tech abilities like Touch screen etc. Its basic purpose is only calls. Means it is a phone and it is to be invented to work for long time, and it is designed as for a backup phone. You can take it as for any emergency and without any worry you can enjoy your life. Whenever it is difficult with advanced mobile phones and even you switch of them whenever they consume battery. But this phone call time is only 10 hours, according to their inventors XPAL POWER COMPANY they design it only for emergency conditions and it is automatically tells its location which shows on screen. And for this purpose it uses mobile ID, its AA battery was available in its mobile Pack. Great one, the battery are the major components of the cell phones. truly must write up to your blog.